Galileo is the name of the European satellite navigation system, an initiative launched by the European Union and the European Space Agency (ESA). This global system will be complementary to the current GPS system. Satellite Galileo is based on a constellation of thirty satellites and terrestrial stations providing information to users in many fields on their position. With Galileo, Europe will have its own global satellite navigation system and will free itself from the services offered by the American GPS and its many restrictions. Galileo will provide accurate, secure and certified positioning services on a global scale. It will be controlled by civilian authorities unlike its American equivalent which is controlled by the military. The expected and 'to be invented' applications are multiple: transport (road, rail, air and maritime traffic), energy, agriculture and fishing, personal navigation, search and rescue, crisis management (floods, , maritime disasters, oil slicks, earthquakes, humanitarian aid), environmental management, leisure activities, economy (finance, banking, insurance), etc. The planned economic spin-off for the next 15 years is substantial, with a return on investment assessed at 4.6 and the creation of more than 140,000 jobs. Galileo will be compatible with the American GPS and the Russian Glonass, the other two radionavigation satellite systems which were both designed during the cold war for military purposes. Galileo provides a real time position accuracy of the order of a metre, better than any other public system. Users will be informed within a few seconds of any satellite failure. With these specifications, the European project will be a system adapted to applications in which safety plays a key role, such as rail traffic control, road traffic regulation and aircraft monitoring during the landing phase. The Galileo system will have 30 satellites (27 operational and 3 on standby). They will be distributed in three circular orbits at an altitude of 23,616 km with an angle of inclination of the orbital planes of 56°. Galileo signals will also cover latitudes up to 75° north and south. 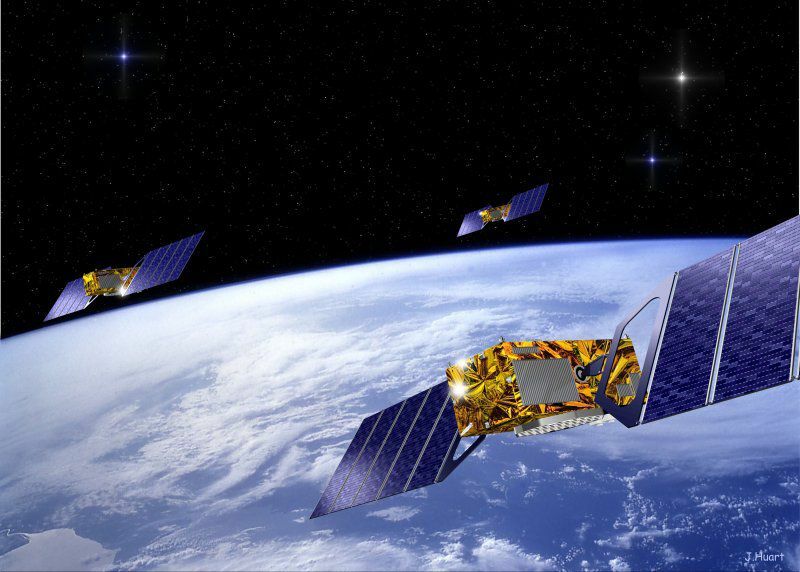 Thanks to the large number of satellites, the optimisation of the constellation and the 3 satellites on active standby, the loss of a satellite should have no great consequences for users. The orbiting satellites will be supported by a global network of ground stations. The first four Galileo satellites form the operational nucleus of the Galileo navigation satellite constellation. The first two operational satellites were placed in orbit on 21 October 2011. In October 2012, a second pair of satellites is scheduled to join them in orbit at 23,222 km altitude to validate the Galileo system concept, before the launch of the 26 other satellites to form the constellation.